Wendell Berry's profound critique of American culture has entered its sixth decade, and in this gathering he reaches with deep devotion toward a long view of Agrarian philosophy. Mr. Berry believes that American cultural problems are nearly always aligned with their agricultural problems, and recent events have shone a terrible spotlight on the divides between our urban and rural citizens. Our communities are as endangered as our landscapes. There is, as Berry outlines, still much work to do, and our daily lives--in hope and affection--must triumph over despair. Mr. Berry moves deftly between the real and the imagined. 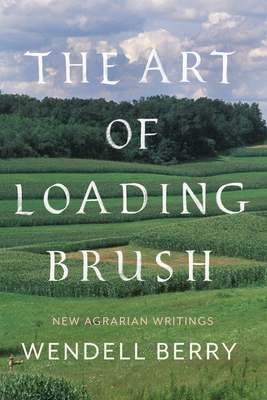 The Art of Loading Brush is an energetic mix of essays and stories, including "The Thought of Limits in a Prodigal Age," which explores Agrarian ideals as they present themselves historically and as they might apply to our work today. "The Presence of Nature in the Natural World" is added here as the bookend of this developing New Agrarianism. Four stories extend the Port William story as it follows Andy Catlett throughout his life to this present moment. Andy works alongside his grandson in "The Art of Loading Brush," one of the most moving and tender stories of the entire Port William cycle. Filled with insights and new revelations from a mind thorough in its considerations and careful in its presentations, The Art of Loading Brush is a necessary and timely collection.